Rome, Italy (LifeNews.com) -- Bob Schindler understands the pain of a father who saw his daughter change from a woman full of life to a seemingly lifeless person plagued by the effects of a severe medical condition. Although it may seem hopeless, Schindler urged the father of Eluana Englaro not to give up on his daughter's recovery. The plea came in the form of a letter Schindler has written to Beppino Englaro, that LifeNews.com obtained, asking him to not subject his daughter to the same kind of death Terri faced. "Although we come from two different continents with different cultures, we do have many things in common. We both are fathers and we both have been gifted by the same God with children," Schindler writes Mr. Englaro. "We both have a child that suffered severe brain injuries. I know very well the profound effect this type of injury can have on our loved one and their families. We both have experienced the same misfortune and hardships," he added. 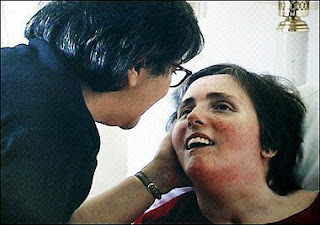 Like Englaro, Terri Schiavo was unable to make her own medical decisions. Unlike the Italian woman who is at the center of the latest euthanasia debate, Terri's family wanted to provide her the best care possible and fought her former husband's decision to kill her by depriving her of food and water. "We do differ," Schindler explained. "Your daughter is alive and mine is not. You have control of Eluana’s future. I did not have any input regarding Terri."